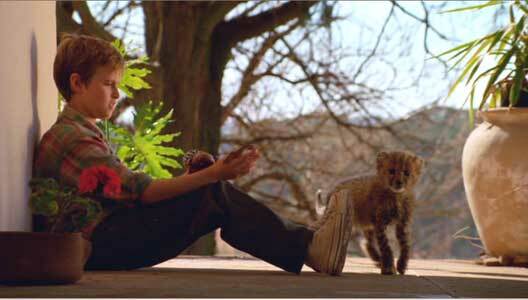 Alex Michaeletos wears optical white high top Converse “Chuck Taylor” All Stars in the film. 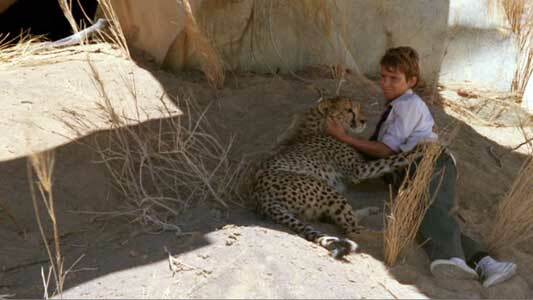 Xan quickly bonds with the cheetah cub Duma. Duma begins in the wildnerness preserves of northwestern South Africa. A cheetah has recently had cubs, but is threatened by a lion and killed in a fight. Missing its mother, one of the cubs wanders off and onto a road. By chance, 12-year-old Xan (Alex Michaeletos) and his father Peter (Campbell Scott) are driving by, see the cub and stop. The cub is very fortunate, first that someone would stop, but also that instead being grabbed for sale in the exotic animal market, or run over by the huge truck that rushes by in the next minute, he is going to be taken to a safe place and raised as a family pet. Xan, along with his father and mother Kristin (Hope Davis) live on a small farm, and actually have the means and knowledge to care for the cub. Xan is thrilled to have such an exotic pet, and soon becomes inseparable with the cub, who he house trains and names Duma, after the Swahili word that means cheetah. Xan and Duma live an idyllic life for a while, playing together on the farm, but there is a time clock ticking in the background. Duma grows up fast to adult size, and Peter tells Xan that he must start thinking about the day that Duma will have to be returned to the wilderness, his natural habitat. He shows Xan a map of what is involved, a very long trip to the northwest part of South Aftrica. Xan and Duma rest under the shade of a crashed airplane in the desert. Things take a tragic turn for the worse in Xan’s family. Peter suffers a series of strokes, and dies, leaving Kristin alone to manage the family farm. She realizes that she cannot do this by herself, so she leases the farm and takes Xan and Duma with her into the city to live with her sister Gwen (Jennifer Steyn). Kristin plans to turn Duma over to wildlife preserve officials in a few days much to the dismay of Xan who wants to follow his father’s plan and return Duma to his native home. Living in the city is a very uncomfortable fit for everyone: Gwen doesn’t know how to deal with the huge cat that is now sitting in her living room, Xan is unused to the ways of city kids in middle school, and Duma, not wishing to be confined inside, decides to follow Xan to school the first day. Duma causes quite an uproar when he is discovered on campus, although there are a few funny moments, like when the girl seated next to Xan thinks he is flirting with her when he sees Duma outside his window, or when three bullies start to rough up Xan and steal his money only to be faced down by a growling Duma. Quickly the school gets into an uproar as everyone flees to escape the “ferocious beast” and the authorities are called in to capture or shoot Duma. Xan quickly realizes that the only thing that he can do now to protect Duma is to escape from the city and begin the long journey to return Duma to his natural home. Xan and Duma are able to get to the edge of the city and hide until darkness. They return to the farm and pick up his father’s motorcycle and the two head off on the long journey to Duma’s home. What an image you see on screen: a twelve-year-old boy driving a motorcycle with a cheetah resting comfortably in the sidecar. Xan meets up with Ripkuna after the motorcycle has run out of gas. Xan shows a lot of ingenuity in his ability to escape the city with Duma, but with no planning or thinking about distances and supplies, he soon runs out of gasoline and water. Stranded in the middle of the Kalahari Desert, Xan starts pushing the motorcycle. A few miles ahead they spot the remains of a crashed airplane, and rest there. As darkness comes, a stranger approaches. 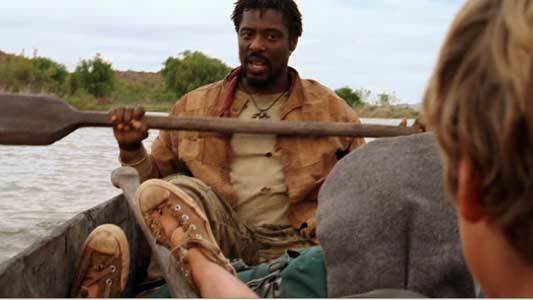 The stranger, a native tribeaman named Ripkuna (Eamonn Walker), tries to start up the motorcycle to no avail, and the two meet each other, suspisciouly at first, bargaining hard over the water that Ripkuna has in his canteen. Deciding that it is in their mutual interests to do so, they agree to travel together at least for the next few days. Xan figures out a clever way to quickly ride across the desert by using the an old parachute from the airplane as a wind sail on the motorcycle. When they reach the foot of the mountains, they must continue on foot. They still are not sure about each other. Ripkuna, who is destitute after an unsuccessful trip to the city wants to look for salvageable items on the way and head north toward his home. Xan wants to go directly west to reach the wildlife refuge where Duma was born. 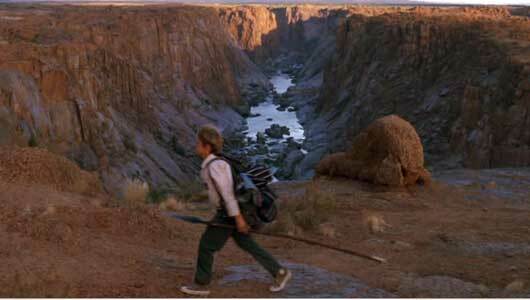 Rip thinks that Xan is crazy to want to go directly into dangerous wilderness. 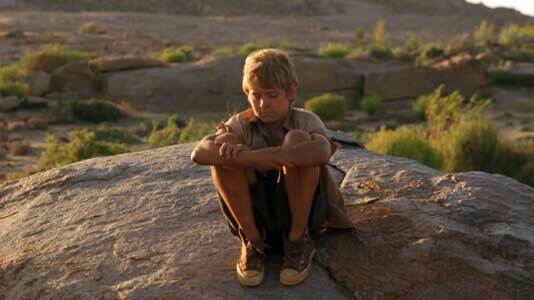 He tells Xan that the land has teeth, and “that is a place to die”. Xan thinks that Rip wants to lead Duma and himself to a place where he can turn them over to the authorities for a reward. At one point, Xan and Duma leave Rip behind in an abandoned diamond mine and go off on their own. Rip later proves his good intentions when he follows them and saves them from serious danger. As their journey continues, Xan and Rip gradually develop a friendship, as they admit to each other their faults. talk about their families, and break down the veil of mistrust. The story line of Duma continues with a series of escalating adventures that pit this unlikely trio against the forces of nature in mountainous terrain, in rivers and rapids, and in the jungle. How Xan and Ripkuna strives to complete their perilous journey and return Duma to his rightful place in the wilderness makes up the remainder of the film. 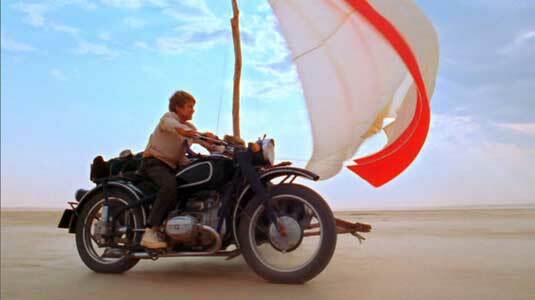 Xan figures out a way to sail through the desert using an abandoned parachute. Xan and Ripkuna grow to trust each other during their adventures through the wilderness of South Africa. Xan’s white high top chucks gradually become the color of the rocks and sand. In the many films reviewed on this site, we have seen chucks travel through the Sahara Desert, ride the rivers of the Amazon jungle, walk the streets of New York’s Hell’s Kitchen, traipse through medieval England, raft down the Mississippi River, time travel on the face of a postage stamp, and wander through the wilderness areas of the Cascade Mountains. 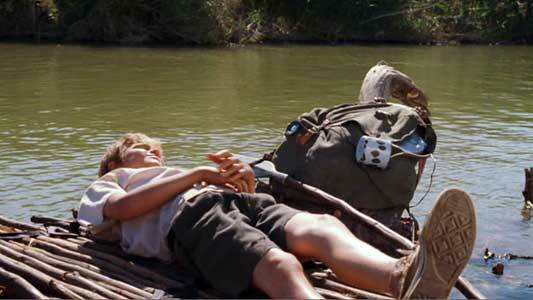 So it is only appropriate that Xan’s optical white high top chucks help him get through the treacherous Kalahari Desert, the rapids of the Okavango Delta, and the wildlife reserves of South Africa on his trek to return Duma to his native habitat. When Xan and Duma start their journey after running away from the authorities, there is a moment of uncertainty, as Xan is still wearing his school uniform complete with tie and black leather shoes. How is he going to make it through the journey in that outfit? But luckily Xan remembered to bring his chucks with him, and the black shoes are quickly abandoned. 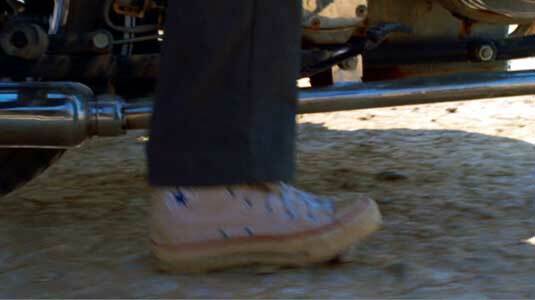 The condition of Xan’s chucks is one of the ways to measure how taxing and difficult the journey becomes. When the journey starts they are a normal broken in pair of white high tops, but by the end of the journey the canvas has become completely brown and torn. Yet they still are functional to the end of the film. Click on the thumbnails below to see more shots of this transformation. Xan pushes the motorcycle, Xan meets up with Ripkuna, walking through the mountains, relaxing on an improvised raft, swimming through the rapids, seeking Duma in the dark of the night. Duma. (2005) Alex Michaeletos, Eamonn Walker, Campbell Scott, Hope Davis. Directed by Carroll Ballard. Categories: Action/Adventure, Family, Drama.